In Russia, Scant Traces And Negative Memories Of A Century-Old U.S. Intervention : Parallels As Americans accuse the Kremlin of interfering in their elections, and Russians fiercely deny it, there's no debating that the U.S. once intervened militarily in Russia — with few, if any, results. 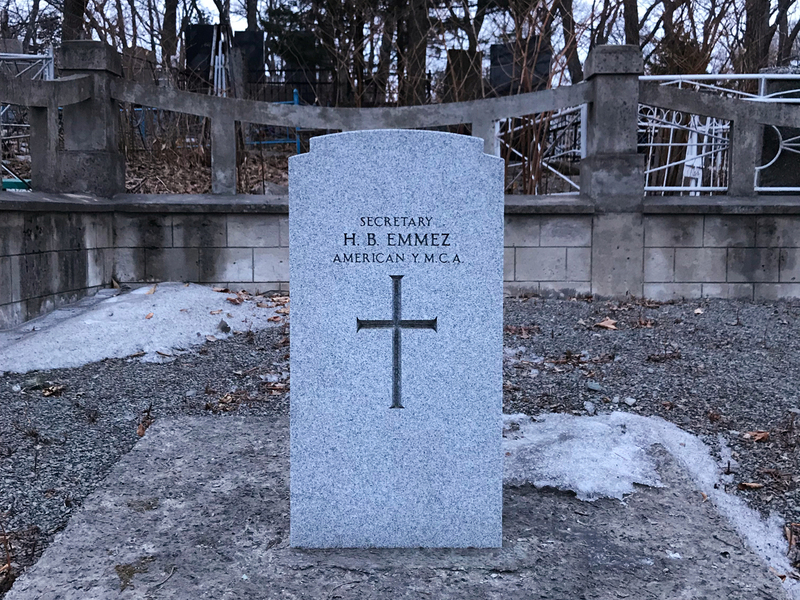 H. B. Emmez, a YMCA employee who took part in the U.S. intervention a century ago, is the only American buried in Vladivostok's Naval Cemetery. Emmez is one of the Americans who didn't come home from a U.S. military intervention that began in 1918. He died of typhus while part of a YMCA group that entertained and ministered to American troops sent to protect military stocks in the violent aftermath of the Russian Revolution. The bodies of U.S. servicemen who died during the mission were later repatriated. A century after thousands of U.S. soldiers set foot on Russian soil, their story has largely been forgotten, in the United States as in Russia. But as Americans accuse the Kremlin of interfering in their elections, and Russians fiercely deny it, there's no debating that the United States once intervened militarily in Russia — with few, if any, results. One hundred years ago, civil war was raging across Russia as the Bolsheviks, who had seized power the previous November intending to establish a Communist government, struggled against their myriad opponents known as the "Whites" — supporters of the deposed czar, republicans, social democrats, Cossacks. At the same time, victory in World War I was far from assured, and the United States, which entered the war in April 1917, was alarmed when the Bolsheviks withdrew Russia from the common fight against Germany in March 1918. "The Americans were anxiously observing events in Russia, especially as the Allies were still fighting while the Russian army had disintegrated, which of course could affect the outcome on the Western Front," said Alexei Buyakov, a Vladivostok historian. 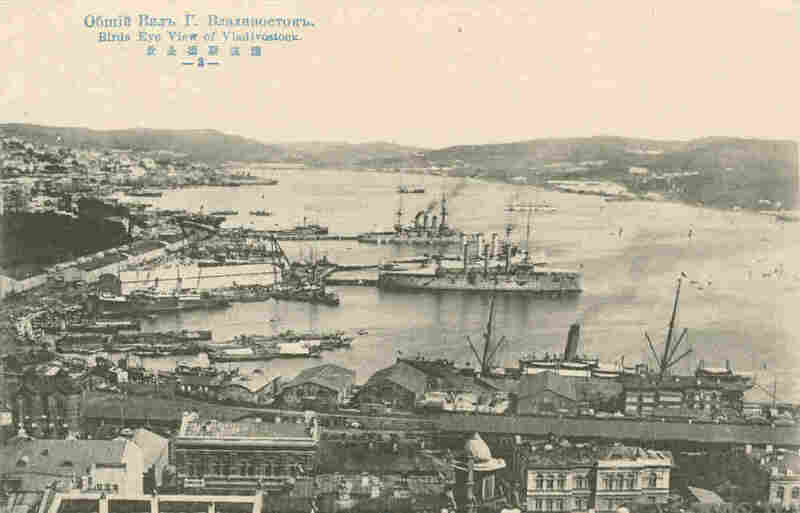 More than 8,000 U.S. troops started landing in Vladivostok in August 1918 to guard Allied military stocks that had been shipped to Russia and to protect the eastern terminus of the Trans-Siberian Railway, the strategic link that held Russia's vast territory together. A second U.S. force was sent to Arkhangelsk, a northern seaport, with a similar mission to secure key infrastructure amid the turmoil gripping Russia. U.S. troops wearing new sheep-lined coats march in downtown Vladivostok in November 1918. In Vladivostok, almost 6,000 miles to the east of Moscow, the Americans joined soldiers from a dozen allied countries, including Japan, Great Britain and France. Although the U.S. troops were officially neutral, they inevitably got caught up in skirmishes between pro-Bolshevik partisans and the Whites. About 200 Americans are believed to have died in eastern Russia during the 19-month mission — many of them, like Emmez, from disease. In the shifting landscape of partisans, warlords, bandits and foreign combatants, the U.S. role was hardly clear-cut and sometimes clashed with that of other allies. The Americans became particularly wary of Japan, which had deployed 70,000 troops. Washington wanted to prevent Tokyo from expanding its sphere of influence and splitting up Russia. "The Americans sometimes protected the partisans from the Japanese, to their own detriment," said Buyakov. "They even helped the partisans with food aid." One of the most intriguing figures during the American intervention was Samuel Johnson, a U.S. major born in Russia by the name Boris Ignatyev. Buyakov credits Johnson's leadership of the international police force with bringing a modicum of order to the city in the lawless days of the civil war. The U.S. troops finally left Vladivostok in 1920, a year-and-a-half after World War I ended, and the Bolsheviks eventually took control of the entire country. But it wasn't until 1933 that the United States established diplomatic relations with the Soviet Union. "Americans got here with the hope that Russia would become this democratic, free nation," said Paul Behringer, a doctoral student at the American University in Washington, D.C., writing his dissertation on the U.S. and Japanese military interventions. "Then the chaos of the civil war — the violence and the oppression they're witnessing on all sides — turns Americans off to that idea. Not a lot came of the intervention, and Americans, as well as White supporters, felt very disappointed and disenchanted that the U.S. troops had to leave without any tangible results." Behringer says the U.S. intervention ran into some of the same problems as later American deployments such as in Vietnam, Iraq or Afghanistan: The troops lacked a clearly defined objective set by political leaders back in Washington — and their mission was confused by the humanitarian concerns and ideological positions of auxiliary organizations like the American Red Cross and YMCA. In the decades following World War II, the memory of the hapless U.S. expeditionary force fed into Soviet propaganda as evidence of America's imperialistic intentions. 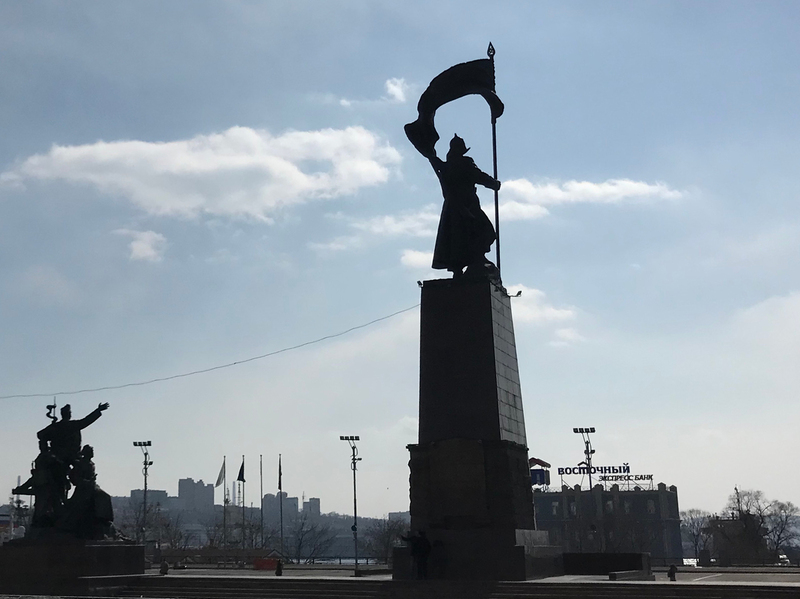 One of Vladivostok's central squares still features a gargantuan ensemble of statues glorifying the Bolshevik partisans' fight for Soviet supremacy in the Russian Far East. "Even though the American role in the intervention was quite ambiguous from even the Communist point of view, it certainly provided a lot of fodder for the Soviet government during the Cold War," said Behringer. A Soviet-era memorial on Vladivostok's waterfront is dedicated to the partisans who helped establish Soviet power in Russia's Far East a century ago. Besides the pompous memorial, there are scant traces of the intervention left in Vladivostok. No public commemorations of the dramatic events a century ago are planned this year. In the city museum, a single display case is dedicated to the foreign intervention, including a grenade, leg shackles and folded U.S., British and Japanese flags. The accompanying text says the Americans, like the Japanese, were involved in bloody reprisals against the local population and looted gold, fish, furs and timber worth hundreds of millions of rubles. "There are stories about American atrocities, but I haven't found any in the primary sources. Those stories usually come much later," said Behringer, who spent half a year researching in Vladivostok's archives. "You hear about Americans getting into a fight in a bar and killing someone — but nothing on a massive scale." A view of the Vladivostok harbor. U.S. and other foreign troops began landing at the city's port in 1918. Despite negative memories of the U.S. intervention, Vladivostok has always been open to American influence since its founding in 1860. 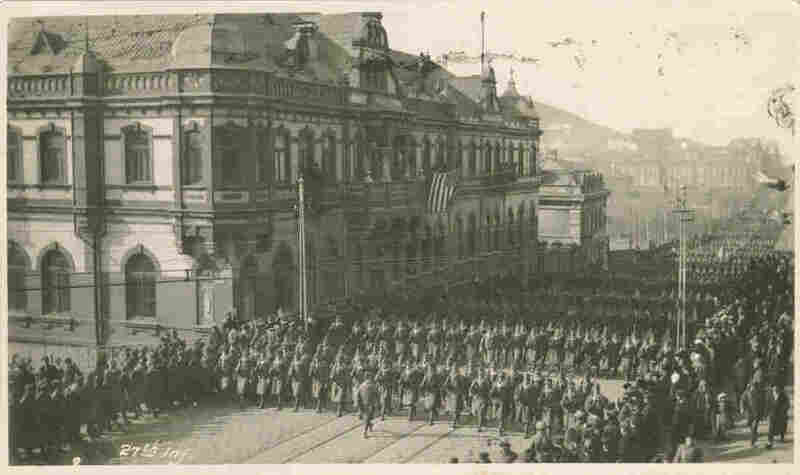 The city's main street, which U.S. troops can be seen marching down in old photographs, was originally called Amerikanskaya ulitsa, or American Street. The United States had a trade mission dating back to Vladivostok's earliest days, and today the city is home to an American consulate. There is even a statue of Eleanor Pray, an American who lived with her merchant husband in Vladivostok at the turn of the last century. Her letters home over a 36-year period were published in 2013. Buyakov says Russia's understanding of the U.S. intervention has become more nuanced since the collapse of the Soviet Union in 1991 and the exchange of scholarship with American colleagues since. The bigger historical picture is also important, he says. "Vladivostok served not only as a gateway for the so-called interventionists but later allowed for the delivery of U.S. military assistance that helped the Soviet Union defeat Nazi Germany," Buyakov said. He knows that from a first-hand source: During World War II, Buyakov's father was the radio officer on a Soviet ship that ferried American weapons from San Francisco to Vladivostok.